Knowledge of the hearing abilities and other acoustic features of marine animals is important when measuring the effects of sound on marine animals. (For more information see How do marine animals hear sounds?). Hearing studies provide information that may be used to predict how sound sources and levels may affect animals in the wild. If an animal is unable to detect a sound or hears a sound only faintly because of its hearing range or sensitivity, it is unlikely the animal will have a behavioral reaction or hearing loss from the sound. Hearing studies on marine mammals are conducted in three different ways: behavioral studies, electro-physiological studies, and anatomical studies. Most hearing studies are performed on animals in captivity, therefore the information that is available tends to be for the smaller marine mammals such as pinnipeds (seals, sea lions, and walruses), sirenians (manatees and dugongs), and some odontocetes (toothed whales). Hearing studies on mysticetes (baleen whales) have been limited primarily to anatomical studies and modeling because they are not kept regularly in captivity, and so far it has not been possible to successfully perform hearing tests with these animals if stranded. Behavioral hearing studies are conducted to determine the range of frequencies and how well an animal can hear across those frequencies. The softest or lowest level at which an animal can hear a sound is called its hearing threshold for that frequency. 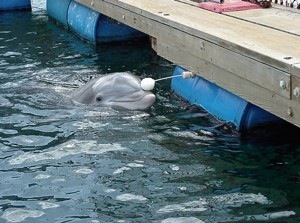 Behavioral studies are performed with trained animals, in captivity. The animal is trained to move to a station underwater while a sound is played. If the animal hears the sound, it responds in a particular way, such as pressing a paddle. If the animal doesn’t hear the sound (or if no sound is played), it does not respond. By changing the loudness of the test signal, scientists determine the frequencies and sound levels the animal can hear. These measurements are presented as a hearing threshold curve. The bottlenose dolphin is touching a paddle, indicating that it heard a sound during a behavioral hearing test. Photo courtesy of Paul E. Nachtigall, Hawaii Institute of Marine Biology. 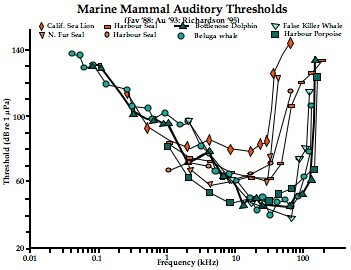 Estimates of the hearing thresholds for some marine mammals. The y-axis (vertical) for the hearing thresholds is relative intensity in underwater dB. The x-axis (horizontal) is the frequency of a sound on a logarithmic scale. Figure courtesy of Darlene Ketten, Woods Hole Oceanographic Institution and Harvard Medical School. Electrophysiological studies have also been used to determine the threshold of hearing in many animals. Auditory evoked potential (AEP) and auditory brainstem response (ABR) tests measure the neural responses of the auditory system, from the inner ear to the auditory cortex, to a sound stimulus. During these studies, small electrodes placed on the surface or just below the skin of the animal record the voltages produced at different points along the auditory pathway. The results are plotted as a curve of the amplitudes of responses over time, and are called short, middle and long latency responses. The first five peaks of the AEP or ABR correspond to responses from first the auditory nerve near the cochlea, then in the auditory brainstem. The later peaks represent responses as far as the auditory cortex in the temporal lobes of the brain. The height or amplitude of the response represents how well an animal hears a sound. These tests are important tools because they can be done quickly and do not require any training compared to the extensive training and expense necessary for captive animal behavioral hearing tests. Differences in the response magnitude and timing (the latency) compared to normal hearing can help determine if an animal is hearing impaired and where in the auditory path a problem occurs. Comparison of the results of behavioral responses and AEP/ABR tests (conducted on the same individuals) typically shows some differences in sensitivity but similar hearing curve shapes and frequency ranges.Szymanski, M. D., Bain, D. E., Kiehl, K., Pennington, S., Wong, S., & Henry, K. R. (1999). Killer whale (Orcinus orca) hearing: Auditory brainstem response and behavioral audiograms. The Journal of the Acoustical Society of America, 106(2), 1134–1141. https://doi.org/10.1121/1.427121. Both are valuable for assessing marine mammal hearing Houser, D. S., Gomez-Rubio, A., & Finneran, J. J. (2008). Evoked potential audiometry of 13 Pacific bottlenose dolphins (Tursiops truncatus gilli). Marine Mammal Science, 24(1), 28–41. https://doi.org/10.1111/j.1748-7692.2007.00148.x. The false killer whale’s hearing is being measured using an auditory brainstem response (ABR) testSupin, A. Y., Nachtigall, P. E., Au, W. W. L., & Breese, M. (2004). The interaction of outgoing echolocation pulses and echoes in the false killer whale’s auditory system: Evoked-potential study. The Journal of the Acoustical Society of America, 115(6), 3218–3225. https://doi.org/10.1121/1.1707088Supin, A. Y., Nachtigall, P. E., Pawloski, J., & Au, W. W. L. (2003). Evoked potential recording during echolocation in a false killer whale Pseudorca crassidens (L). The Journal of the Acoustical Society of America, 113(5), 2408–2411. https://doi.org/10.1121/1.1561497. The probes, attached to the animal’s head and back using suction cups, measure small electrical voltages produced by the brain in response to an acoustic stimulation. Photo courtesy of Paul E. Nachtigall, Hawaii Institute of Marine Biology. Behavioral and electrophysiological studies in controlled experiments can also be used to study whether an animal’s hearing changes after exposure to various sounds (For more information see Hearing Loss). Hearing capabilities are studied also by developing models based on the anatomy of the auditory systems of different species, particularly those that cannot be tested by behavioral responses or AEP and ABRGreenwood, D. D. (1961). Critical bandwidth and the frequency coordinates of the basilar membrane. The Journal of the Acoustical Society of America, 33(10), 1344–1356. https://doi.org/10.1121/1.1908437Greenwood, D. D. (1990). A cochlear frequency‐position function for several species—29 years later. The Journal of the Acoustical Society of America, 87(6), 2592–2605. https://doi.org/10.1121/1.399052. Modelling methods were used first with human and land mammal hearing. Recent studies on marine mammals, turtles, and fishes take advantage of modern technology by combining computerized tomography (CT) scans, magnetic resonance imaging (MRI), and classic dissection methods of the head and ear regions of postmortem animalsKetten, D. R. (1992). The Cetacean Ear: Form, Frequency, and Evolution. In J. A. Thomas, R. A. Kastelein, & A. Y. Supin (Eds. ), Marine Mammal Sensory Systems(pp. 53–75). Boston, MA: Springer US. https://doi.org/10.1007/978-1-4615-3406-8_3Ketten, D. R. (1994). Functional analyses of whale ears: adaptations for underwater hearing. In Proceedings of OCEANS’94(Vol. 1, p. I/264-I/270). Brest, France: IEEE. https://doi.org/10.1109/OCEANS.1994.363871Ketten, D. R. (1998). Marine mammal auditory systems: A summary of audiometric and anatomical data and its implications for underwater acoustic impacts(No. NOAA-TM-NMFS-SWFSC-256). NOAA Technical Memorandum.. By measuring the size, shape, and physical properties, like stiffness, of parts of the middle and inner ears, researchers can calculate the range of frequencies that an animal can hearMiller, B. S., Zosuls, A. L., Ketten, D. R., & Mountain, D. C. (2006). Middle-ear stiffness of the bottlenose dolphin Tursiops truncatus. IEEE Journal of Oceanic Engineering, 31(1), 87–94. https://doi.org/10.1109/JOE.2006.872208Wartzok, D., & Ketten, D. R. (1999). Marine Mammal Sensory Systems. In J. E. I. Reynolds & S. E. Rommel (Eds. ), Biology of Marine Mammals(pp. 117–175). Washington D.C.: Smithsonian Institution Press.Ketten, D. R. (2002). Marine mammal auditory systems: a summary of audiometric and anatomical data and implications for underwater acoustic impacts. Polarforschung, (72), 79–92.. CT and MRI studies are also providing insight into how mysticetes hear. Much of our knowledge of mysticete hearing has come from these anatomical studiesParks, S. E., Ketten, D. R., O’Malley, J. T., & Arruda, J. (2007). Anatomical predictions of hearing in the North Atlantic right whale. The Anatomical Record: Advances in Integrative Anatomy and Evolutionary Biology, 290(6), 734–744. https://doi.org/10.1002/ar.20527. These methods have even been used for analyzing the hearing of fossil whale specimens to determine how dolphin and whale hearing evolved. These methods are especially useful for determining the hearing of the largest species, like the mysticetes and sperm whales. The models are also done for species that can be directly tested in order to determine how well the models match direct measurements of hearing. Researchers have conducted morphometric analyses and modeled the middle and inner ears of over 10 cetacean species to estimate their hearing range. Studies indicate the hearing range of North Atlantic right whales is from 10 Hz to 22 kHzParks, S. E., Ketten, D. R., O’Malley, J. T., & Arruda, J. (2007). Anatomical predictions of hearing in the North Atlantic right whale. The Anatomical Record: Advances in Integrative Anatomy and Evolutionary Biology, 290(6), 734–744. https://doi.org/10.1002/ar.20527 and the hearing in minke whales ranges from 25 Hz to 33 kHzTubelli, A. A., Zosuls, A., Ketten, D. R., Yamato, M., & Mountain, D. C. (2012). 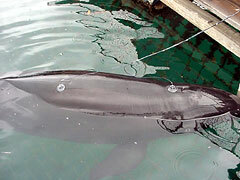 A prediction of the minke whale ( Balaenoptera acutorostrata) middle-ear transfer function. The Journal of the Acoustical Society of America, 132(5), 3263–3272. https://doi.org/10.1121/1.4756950. The most reliable model data indicate that the best hearing range for humpback whales is between 15 Hz and 3 kHz with best sensitivity at or near 1 kHzTubelli, A. A., Zosuls, A., Ketten, D. R., & Mountain, D. C. (2018). A model and experimental approach to the middle ear transfer function related to hearing in the humpback whale ( Megaptera novaeangliae). The Journal of the Acoustical Society of America, 144(2), 525–535. https://doi.org/10.1121/1.5048421. Testing the Hearing of Whales and Dolphins. Gelfand, S. A. (1998). Hearing: an Introduction to Psychological and Physiological Acoustics (3rd ed., and expanded). New York: Marcel Dekker. Møller, A. R. (2000). Hearing: its Physiology and Pathophysiology. San Diego, Calif: Academic Press. Richardson, W. J., Greene, J., Malme, C. I., & Thomson, D. H. (2013). Marine Mammals and Noise. Burlington: Elsevier Science. 9. ↑ Ketten, D. R. (1998). Marine mammal auditory systems: A summary of audiometric and anatomical data and its implications for underwater acoustic impacts(No. NOAA-TM-NMFS-SWFSC-256). NOAA Technical Memorandum. 11. ↑ Wartzok, D., & Ketten, D. R. (1999). Marine Mammal Sensory Systems. In J. E. I. Reynolds & S. E. Rommel (Eds. ), Biology of Marine Mammals(pp. 117–175). Washington D.C.: Smithsonian Institution Press. 12. ↑ Ketten, D. R. (2002). Marine mammal auditory systems: a summary of audiometric and anatomical data and implications for underwater acoustic impacts. Polarforschung, (72), 79–92.